Spring loaded steel bollards bend to withstand impacts then return to an upright position to increase longevity while reducing damage to the bollard itself and other equipment. 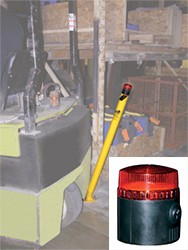 The light and audible alarm operate on two 9V batteries and are located at the top of the 42" tall bollard. Upon impact the sensitive switches inside the module activate the light and siren to warn workers of the collision. 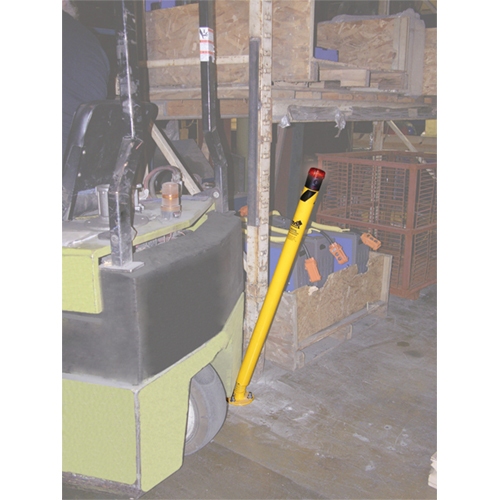 Bollards are mounted to the floor using four 3/8" x 3" anchor bolts that are included with the unit.